Not sure how to prune hybrid tea roses? Use our easy tips to do it right. Hybrid tea roses are grown for their colorful and fragrant flowers. The shorter you cut the stems, the fewer but bigger flowers you’ll get. Just do a light pruning and you’ll get more flowers but they’ll be smaller. When you do your spring pruning, cut all the canes back to 10 to 12 in. high. Cut to an outward-facing bud on each cane, as in the illustration above. Many shrub roses grow on their own roots, but hybrid teas are grafted onto a rootstock. 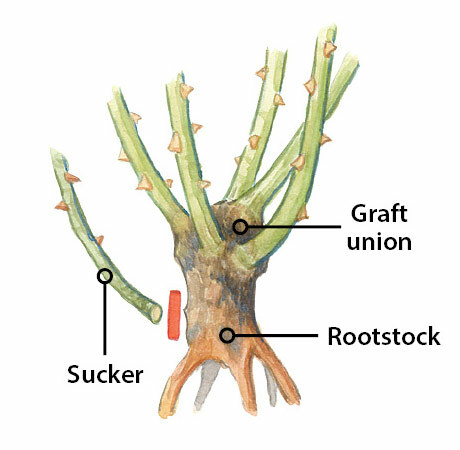 In the illustration above you can see a sucker — a cane emerging from below the graft. Often, the foliage is a different color or size on these suckers. Pull away some soil and cut them off as close to the root as you can. Their flowers will not be the same elegant blooms you get from above the graft. 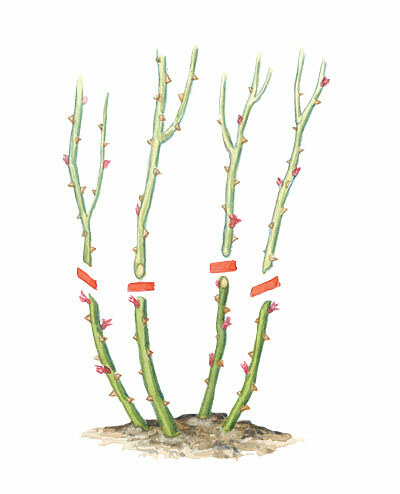 Want to learn how to prune other types of roses? Check out this article.